Countless people like me, from all over the world, only know Elaine because of her interest in human evolution. We heard about some “aquatic ape” and, curious, were drawn in. We read her books and internet postings and watched her in documentaries. We were persuaded by her disarming intelligence and overwhelming common sense and we were charmed by her unpretentious wit. She made us think. She made us smile. She gave us the confidence to take on a world of hard nosed skeptics and knock ‘em cold. Now she’s gone. It is truly sad that such a brilliant mind is no longer with us. We will all miss her endless enthusiasm, optimism and that cheeky grin but for me, the overwhelming emotion now is one of gratitude. The idea that the nitty gritty, physical differences between humans and our nearest relatives in the animal world might all be explained in such a simple, plausible, evidence-based way as through a relatively small shift towards a more aquatic lifestyle – is quite brilliant. It may even turn out to be the best idea pertaining to our evolution since Darwin. 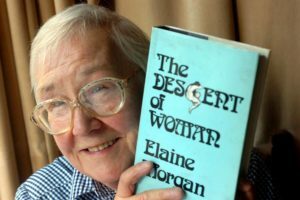 And, although it was not actually Elaine’s own, no-one could deny that she did more to publicise it, develop it, and explain it than anyone else. Thanks, Elaine, for doing that. Of course there are many scientists who would disagree. It’s not such a good idea, they would assure you. These people, in positions of academic authority, could not tell you why we are so different from chimps, but seem certain that whatever it was, it could not have been anything to do with moving through water. A certainty borne more out of peer pressure, note, rather than any attempt at serious scientific investigation. Elaine’s response to this negativity was always to remain positive and inquisitive and a just a little bit cheeky. Daniel Dennett, author of “Darwin’s Dangerous Idea”, when in the company of such people, asked them just to tell him, please, exactly why she must be wrong about the aquatic ape theory. Dennett wrote that he hadn’t yet had a reply worth mentioning, aside from those who admit, with a twinkle in their eyes, that they have often wondered the same thing. That has been my experience too. For over 15 years I’ve tried to find someone, somewhere, who knows what they are talking about, to tell me why Elaine was wrong. I’ve come to the conclusion that such an explanation simply does not exist. The counter arguments are as thin and ad hoc today as they were in 1972 when Elaine’s “The Descent of Woman” was first published. We may never know if Elaine was right or wrong about all this, but it should be obvious to everyone that in order to try to find out, more science needs to be done.